Fetch some friends for a playful twist on a classic game. Want to play a game with your best friend? Then try playing bingo with a pack of playful pups. Instead of numbers and letters, this set uses cards illustrated with 64 different dog breeds, ranging from familiar favorites like the chihuahua and Great Dane, to exotic varieties like the Saluki and the Hungarian Puli. 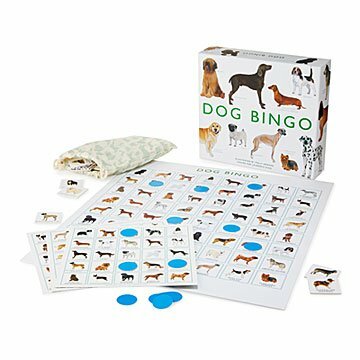 Take your chance with one of 12 bingo cards, using the colorful counters to mark your spots as each breed is called out. It's educational and fun for dog lovers of all ages. Made in China. Great birthday gift for 9 year old who loves dogs. nice products at a good price.